The Backwoods Engineer: Rep Rangel: 358 = "Millions of kids killed"
Screen capture, helpfully labelled by Ol' Backwoods. We're talking about millions of kids dying, being shot down by assault weapons..."
The felon-in-Congress Rangel says, MILLIONS of "kids". He says they are "shot down by assault weapons", by which I guess he means modern sporting rifles derived from the Stoner and Kalashnikov designs. Okay, now for the truth. 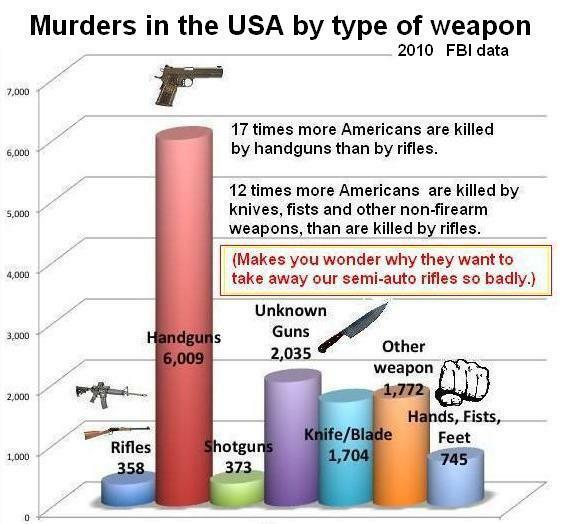 2010 FBI data, compiled into a graph by former Navy SEAL and author Matt Bracken. Notice, if you please, the left bar of the graph above. That is the number of Americans killed by rifles of all kinds in 2010, the latest year we have available. The number is 358, not "millions". Rangel, the felon, is either delusional, or a LIAR. I'm betting on that second one. And he is trying to pull the wool over the eyes of the low-information voter who watches MSNBC. UPDATE: The Blaze concurs with my analysis.